Join noted film critic Debbie Lynn Elias and a line-up of talented co-hosts and informed guests each week as she goes BEHIND THE LENS and below the line with movie reviews, interviews, box office round-ups, awards, festival coverage and more! Now in her 29th year as a critic, debbie taps into her roots in television and film production to delve into those elements that make up the final product you see on the big and small screens, from big budget tentpoles to lo/no budget indies. With interviews and in-studio appearances by the movers and shakers in front of and behind the camera, BEHIND THE LENS will take a look at everything from performance to cinematography, costume design, scoring, editing, scripting and directing. And look for special segments with Tech Talk, Legalese, and the always popular, Classic Corner. As TCM Classic Film Festival and STAGE L.A. events get ever closer on the horizon, you can be sure classic film and theater will also get a lot of love. Tune in! Log on! 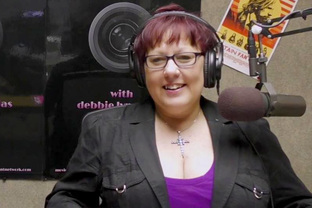 And come BEHIND THE LENS with debbie lynn elias, Mondays at 11AM PT/2PM ET only on AdrenalineRadio.com! See What's LIVE Right Now!